In 1998, I took three of our Caucasians to a Herding Instinct Test (HIT) being run at a sheep farm in Pennsylvania. The local Sheltie Club was having a Fun Day at the farm, and the HIT was just one of many events (agility, Sheep Bowling, obedience, etc.) being offered. I brought the dogs because I had been toying with the idea of coming up with some sort of generic Livestock Guarding Instinct Test to test LGDs with, much like the HIT is used to test the herding breeds. For people who do not own sheep, a test like this may be the only way for their LGDs to be evaluated for the instinct to perform their original function. Despite the heat, the large number of small, quick, barking Shelties, loose farm dogs, lots of sheep everywhere and ducks wandering amongst all, my crew was very well-behaved. They only sounded off once, when a lady and her dog walked up quickly behind our little encampment. The dogs were immediately shushed, and the lady scooted around us with many apologies. Two ladies later came up to meet the dogs, and they told us that there had been some consternation in their group when the word had gotten around that the "Russian Ovcharkas" were coming, but that all concerns were abolished as soon as they saw how nice the dogs were! There were over 30 Shelties entered in the Herding Instinct Test, so we had plenty of time to watch what was happening, and get a feel for what was expected. At my request, we were scheduled last. This had the added benefit of allowing the judge to take time to describe to me the test and how it was judged. 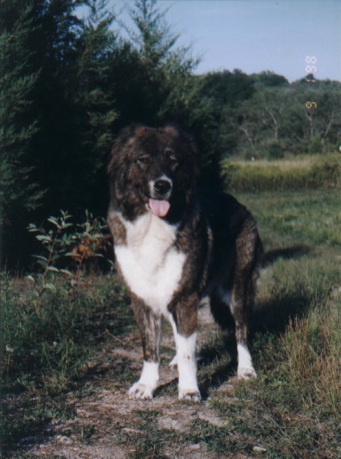 The judge was very concerned that I would have unrealistic expectations of my dogs, because they were not a herding breed, but a livestock guardian breed. I assured her that I was evaluating my dogs’ performance with this in mind. She showed a great deal of interest in evaluating the dogs as flockguardians, and went and dug up two aged, crumbling books from the 1920's, depicting both herding and flockguardian dogs at work in the fields. We went through the two books together, and came up with a few things to look for when the dogs interacted with the sheep. Then I brought the dogs in, one at a time, on-leash, to be judged according to our new criteria. The dog and I entered a corral-like circular pen, where a small band of fresh sheep had been released. The dog was allowed to sniff the sheep, and the consumption of sheep droppings (a delicacy to dogs) was encouraged. (Ugh!) After the judge ensured the dog exhibited only benign interest, the dog was allowed off leash. The dog's interactions with the sheep were noted and compared to the informal criteria we had decided upon. All the dogs did great, even though this was the first time they had ever seen sheep! I had brought one military-style male, ThunderHawk's Warrior Blade, "Kahn", and two mountain-style females, ThunderHawk's Cuerva and Brasa. Cuerva did the best, with Kahn a close second, and Brasa bringing up the rear. (Brasa is young yet.) I was really proud of them -- they each stepped into the pen, saw the sheep, and knew exactly what to do! They kept the "air cushion" in place, protected, and watched, as if they were born doing it! I went home and formalized our criteria, and the result is the first Basic Flockguard Instinct Test (B-FIT) actually judged. If the judge is willing, it can be performed at any Herding Instinct Test to evaluate any flockguardian breed. 2. The dog should not growl, bark, or otherwise aggress at the sheep. 5. If a sheep becomes separated from the flock, the dog should take notice instantly and stay focused on the stray. Rudimentary herding attempts to reunite the sheep with the flock are good, but again, roughness is not desired. 6. The dog should show immediate awareness of the approach of other carnivores to the flock, (e.g., barn cats passing by, approach of another dog towards pen, etc.). Some low-level aggression towards approaching the carnivore is expected and will be tolerated, as long as the owner is in control of dog. When the carnivore departs, the dog's interest should return to the sheep.